There’s always room for another stunning nature documentary in the pantheon of “How did they get that shot?” television. At least that’s what BBC America hopes: 24 Hours On Earth is something of a backdoor pilot for the network’s upcoming “Earth Night” lineup of Planet Earth, Blue Planet, and Wild Things With Dominic Monaghan. As such, 24 Hours On Earth has two jobs: One is to be the visually stunning ecological wake-up call to which all nature documentaries necessarily default. The other is to find a new spin on presenting the overwhelming scope of nature. It nearly succeeds at both. Besides sharks and seals, there are the usual suspects: cheetahs, a meme-ready hyrax, the requisite montage of adorable animal babies. However, it’s the more unusual creatures that impress, like the jellyfish that absorb algae and live off their photosynthesis, spending their days in gentle pursuit of the sun. Composer Ty Unwin has a field day with the range of moods and characterization required by these creatures and their surroundings: There’s a love theme for the full moon, sunning lemurs and their oboe of comic relief, a creeping kakapo and its accompaniment of stealthy xylophone. If some cues aren’t as effective (like halfhearted drum riffs for attacking sharks), there are many more that either underscore or amuse. In the role of celebrity narrator, Matthew Macfadyen tends to be as earnestly serviceable as the whole—but when the script allows, he can also be sublimely grim. In one of the magic moments before nightfall, bats pour out of a cave to hunt. But in the day’s closing minutes, “Eyesight still wins,” Macfadyen purrs, as a hawk snatches a bat from the sky. He also delivers a respectful salute to a dung beetle that uses the stars as navigational tools while pushing poop across the desert sands. But his most sublime narration happens when he becomes romantically invested (which is remarkably often). 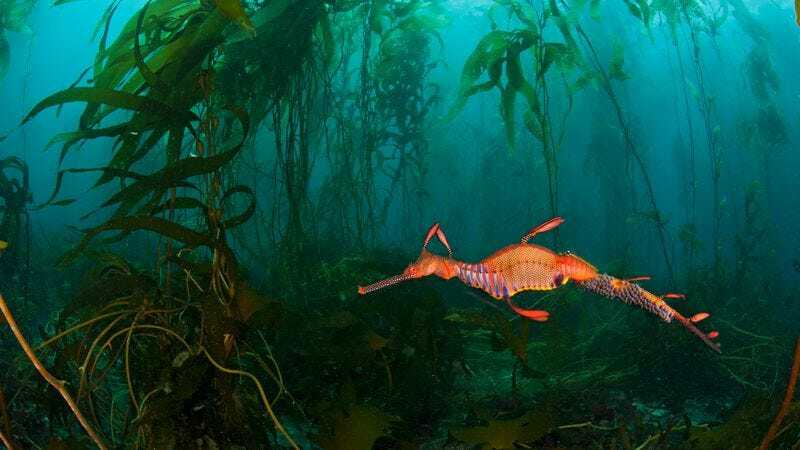 “He needs open water to woo his exquisite female,” Macfadyen assures us with odd over-investment in seadragons, “but he can’t rush her; she won’t give up her eggs until he’s proved he’s Mr. Right. He needs to stay cool, turn on the charm, and impress her… fortunately, she likes what she sees.” Matthew Macfadyen, wingman to marine life everywhere. That said, there are also moments of tonal dissonance that feel either over-edited or flat out callous. Under the Northern Lights, humpback whales lose their way because of the disruption to Earth’s magnetic fields, increasing the whales’ chances of getting stranded on the beach. “But soon it will be morning,” Macfadyen assures us, as if sunlight might allow any beached whales to grow enough legs to drag them back into the water. And though it’s nearly impossible to make any documentary about the wonders of nature without a message about ecological preservation amid the effects of human occupation on a delicate planet, 24 Hours On Earth bizarrely tries its hardest to avoid it. Macfadyen says of the critically endangered kakapo during the midnight hours, “There are less than 150 left in the wild, which can make finding a mate unusually difficult,” with a delivery that suggests other kakapos have moved to the suburbs to avoid the full moon, rather than having suffered under human encroachment and hunting. It’s a disingenuous sour note in a documentary that’s ostensibly focused on the crucial and complicated balance of life in a series of fragile ecosystems. Still, nature is its own best advertisement, and it’s hard to deny the visual impact of the series’ high points. For sheer bragging rights, the winner might be the macro shot of a nocturnal gecko opening one eye, providing a black plate that highlights the full moon. But it’s worth noting that, despite plenty of impressive moments taken separately, there are only one or two glimpses of a promising, larger whole. Of these sequences, the most beautiful unfolds in deep night, as bioluminescent sea creatures make underwater constellations that mirror the breathtaking night sky over their heads, and the false starfield of a predator glowworm becomes the gleam of 30 wildebeest eyes in a night-vision camera. It’s the smartest editing in the two hours, deftly illuminating the poetry of intertwined life that the rest of the documentary approaches but never quite reaches. If later programs feature a few more moments like those, Earth Night might still find magic.